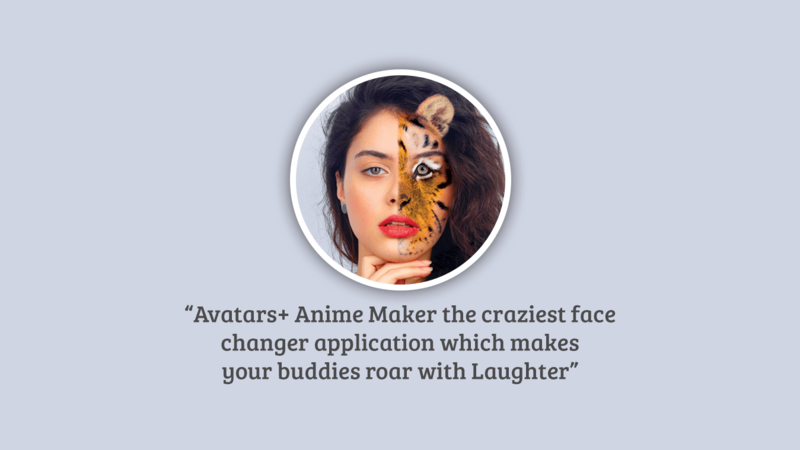 Avatar+ Anime Maker is the funniest face changer app which can totally transform your look from cute, funny to scary animal faces. With no other filters on it, instant blending of animal face mask, beards, hairstyles and many other snap stickers completely stunning picture. No extra efforts needed to set the mask, just drag to rotate left/right, scale horizontally/vertically with colorful masks and funny faces to get the ultimate Avatar. Get scariest wild animal masks and give your photo a wild look, queen’s crown and flower crowns to get princess look, beards and mustaches to get look different, eye masks, and many snappy photos. 2. 6 Distinct Categories – Categories include eye masks, wild animal half face mask, cute dog faces, snappy stickers, funny hairstyles and emojis, beards and mustaches. 4. Save and share with just a tap through message, mail or on any social media. You will love changing your picture again and again by using new Avatars, download all these avatars and have fun sharing your wildest pictures.